Orange is best know for its astringent and toning properties, helping restoring collagen in our body which is responsible for skin firming and preventing early aging of skin. The fruit is rich in citric acid, which is very helpful in drying acne and gently exfoliating your skin to reveal a brighter skin every day. 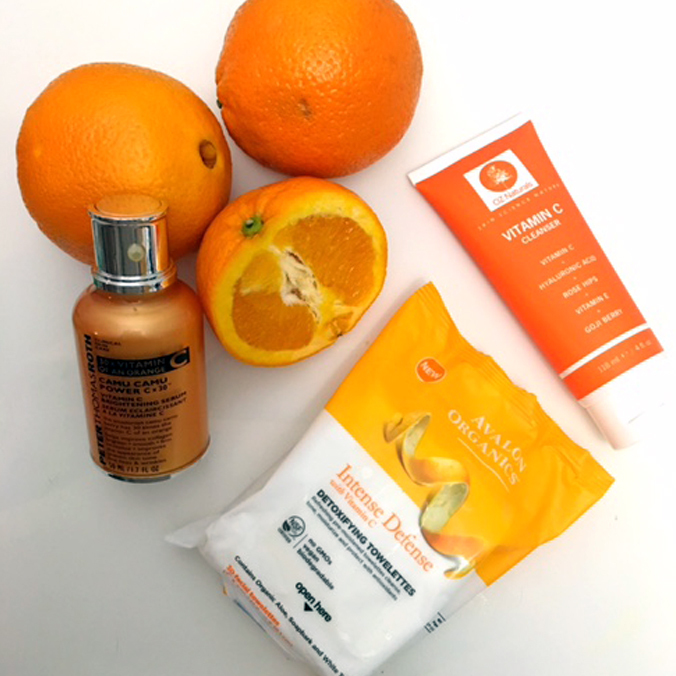 Here are a few orange-based products I believe are well-worth the squeeze (not literally). Avalon Organics Antioxidant Oil – Intense Defense balances vitamin C, white tea and lemon bioflavonoids to defend skin and support its natural renewal cycle. The oil reinforcing skin’s natural lipid barrier, which locks in moisture and protects skin against environmental stressors. 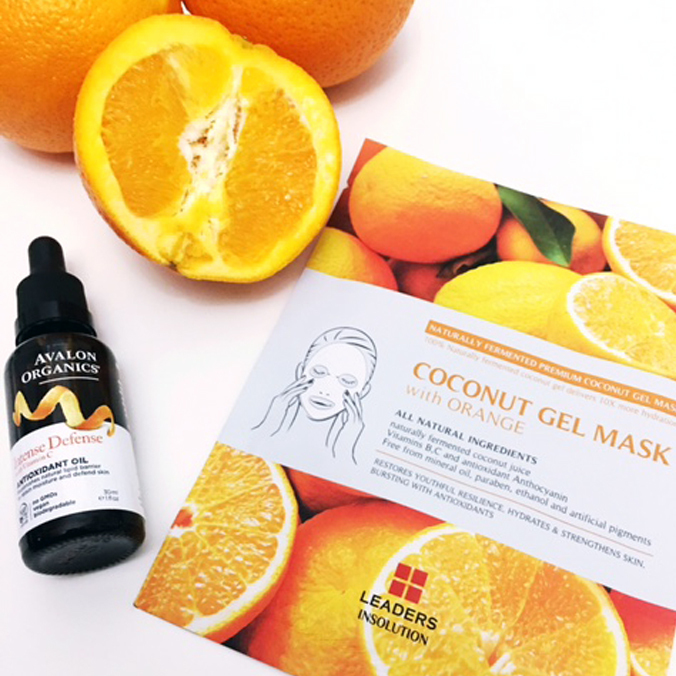 Leaders Superfood Coconut Gel Mask – Looking to treat dull, uneven skin tone, blemishes or to tighten pores? Rich in Vitamin C and Alpha-Hydroxy Acid (AHA) ingredients, this Orange sheet mask keeps the skin nourished while brightening skin tone and enhancing skin texture. Peter Thomas Roth Camu Camu Power C x 30 Vitamin C Brightening Serum – When used under my daily moisturizer this Vitamin C powered serum supports natural collagen while brightening, smoothing, firming, revitalizing, and improving the appearance of uneven skintone. Powerful antioxidant Camu Camu with vitamins A, D, and E also helps revitalize the look of skin while helping to fight free radical attack. Avalon Organics Intense Defense with Vitamin C Detoxifying Towelettes – Alike to your typical makeup removing wipes, Avalon Organics’ Detoxifying Towelettes remove makeup, dirt and grime with the added benefit of a complete blend of antioxidant-rich Vitamin C, White Tea and Lemon Bioflavonoids to defend skin and support its natural renewal cycle. OZNaturals Vitamin C Cleanser – This Vitamin C Cleanser helps fade the appearance of sun spots and discoloration, refining skin texture and reducing the appearance of fine lines. This aloe vera and sugar-based, sulfate-free wash should be used daily along with a Vitamin C serum, a moisturizer and eye treatment for best results. 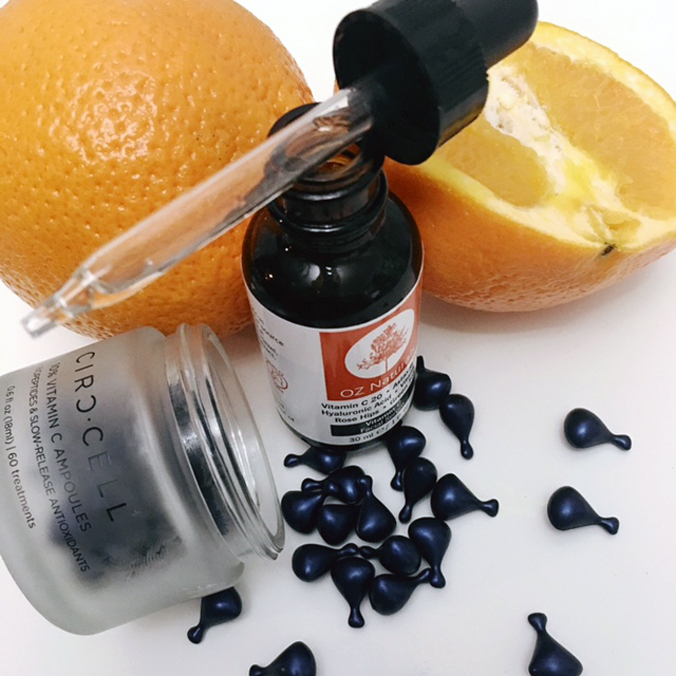 CIRCCELL Vitamin C Ampoules – With three forms of Vitamin C, a single-use capsule firms skin and enhances elasticity. A breakthrough blend of antioxidants and biopeptides reduces the appearance of fine lines and wrinkles and protects skin from the visible effects of sun and environmental damage. OZNaturals Vitamin C Serum – Once I finished Peter Thomas Roth’s Vitamin C Brightening Serum, I moved on to one from OZNaturals and was equally impressed. OZNaturals Vitamin C Serum with Hyaluronic Acid combines the highest quality Vitamin C and Hyaluronic acid to create a potent antioxidant that goes on smoothly (aka doesn’t pill under moisturizer or makeup) and helps protect and brighten your skin throughout the day. Avalon Organics Intense Defense Sheer Moisture SPF 10 – While I don’t use this directly with a Vitamin C serum, I switch off days, using this every other day over other serums to nourish my skin while protecting it against incidental daily UV exposure. Insider Tip: Apply it liberally to face, neck and chest after cleansing and toning and 15 minutes BEFORE sun exposure. 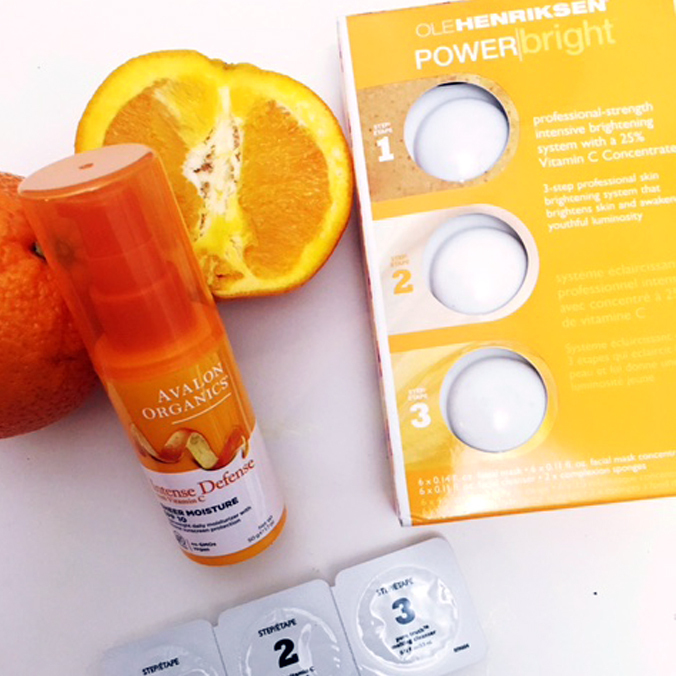 Ole Henriksen POWER Bright 3-step Professional Brightening System – By far the coolest Vitamin C product I’ve tested and tried in years, Ole Henriksen POWER Bright 3-step Professional Brightening System is worth the process.The professional-strength three-step brightening system has an unprecedented 25 percent vitamin C concentrate to deliver maximum radiance in as little as one use. Insider Tip: Step 1: Polish Truth Sugar Glow Polishing Mask: Apply to clean, damp skin, leave on for 5-10 minutes. Apply warm water and gently massage in a circular motion for 30 seconds, then rinse clean and pat dry. 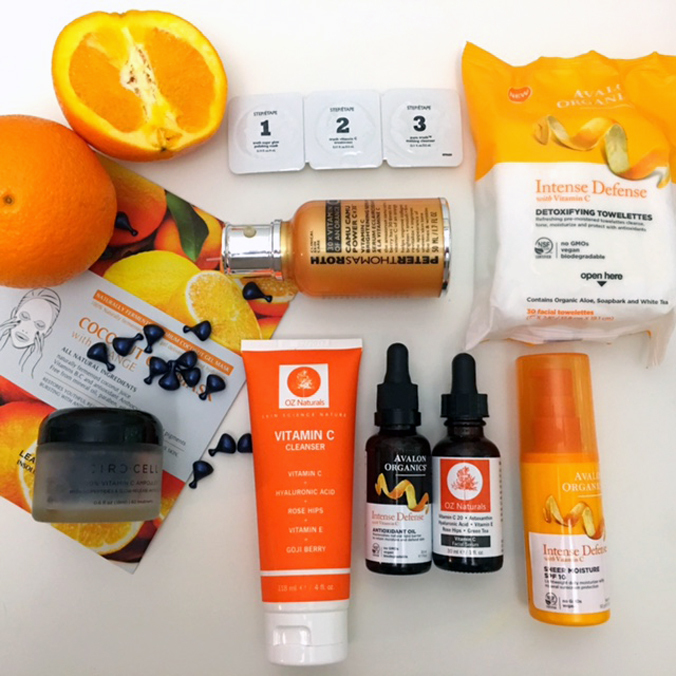 Step 2: Brighten Truth 25% Vitamin C Concentrate: Apply to dry skin and leave on for 2-3 minutes. Step 3: Glow Pure Truth Melting Cleanser: Apply directly on top of the 25% vitamin C concentrate and blend evenly over face. Do not add water and do expect a light tingling and warming sensation as the treatment is activated. Leave on for 10-15 minutes and to remove, dampen complexion sponges (included), or a washcloth, with lukewarm water and swipe gently to remove all product.